Posted by Nrgleeeeeeflump and WIGGGGNa (or Ted and Alice, as they prefer to be known). Way back when one of the humans was heavy with its young she befriended a couple of ducks – us wiggly pets noticed that one of the ducks appeared to be heavy with young and waddling too! Now we were all very excited about the appearance of the human’s wiggly woo – they only have one at a time can you believe it and they call it a baby! I now I keep mentioning this but I just find it so silly. Anyway the human fed the ducks and cooed over them almost as much as Alice (she says at least she wasn’t threatening them with oranges and plums and shouting “sauce sauce”! I’ve tried to explain that I didn’t realise the origin of the human custom and would never have done it if I’d known – she is now rolling her eyes, which I think is most unfair). The ducks made a nest behind the human’s house and we all watched them with interest. Unfortunatley the magpies got the eggs and everybody was sad; the human even cried – apparently they get like that when heavy with young. 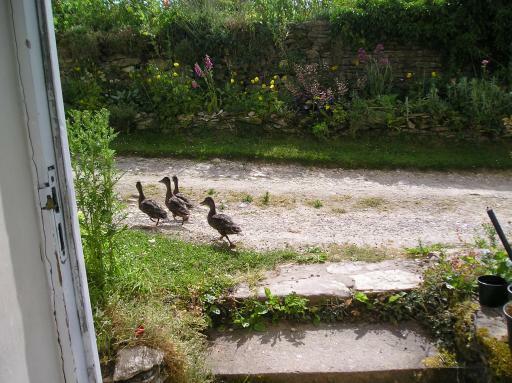 The ducks stayed however and soon were having a second brood. We Wiggly Pets, being naturally helpful creatures, decided that we would help scare the crows and magpies away from the new eggs and the humans helped. Six little ducklings hatched and Alice got rather involved in looking after them (she says I’m not to mention the teaching them how to swim incident – so I won’t mention how she ended up at the bottom of the stream being nibbled by trout!). They swam around and only went down the waterfall a couple of time but they were all ok, much to everybody’s relief. One day when the human’s wiggly woo was very small we were all having toast and crumpets by the fire when there was an awful sound; we thought Tim (one of the cats) had been cornered by a fox or something like that. There was thumping and crashing from the where the humans keep their wood and coal in the gully in front of the house. We all rushed out side, the human first; she shone a torch down the dark gully and there was a squabble of birds! Suddenly the mummy duck came crashing through and flew at the human making a lot of noise. 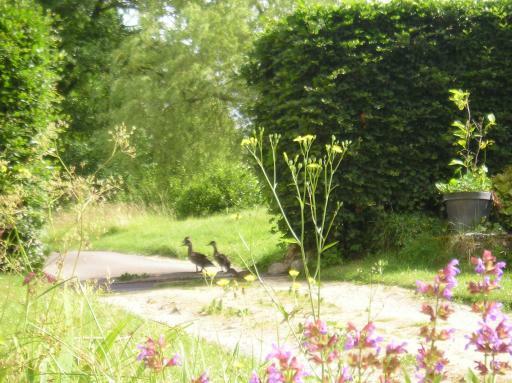 We realised that she was trying to lurer the ‘predator’ away from the ducklings, having ascertained there was no danger to them we grabbed the camera for the human who took photographs of the ducklings as they came out of the gully and up the steps. (Alice is trying to interrupt but as she wacked me on the head earlier for mentioning trout I’m not listerning to her). 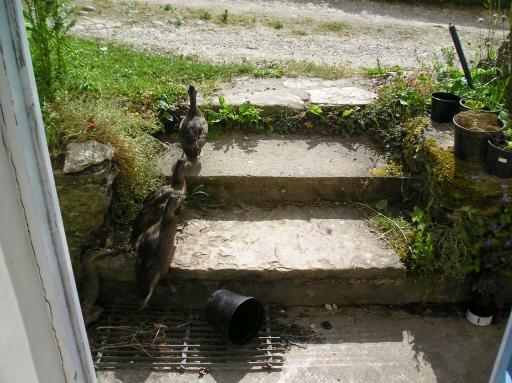 It was only when they did this that we realised they weren’t really ducklings anymore, but nor were they fully grown ducks and as one of them fell over on the cattle grid; we realised that we had teenager ducks and Alice almost cried at the fact they are all grown up. Helping bringing up the ducklings was a very special adventure! Hope to see you all again next week.